Adding new product to your Etsy shop is a fantastic way to give your sales a boost (I wrote an in-depth blog post about it here, in fact), but sometimes in our overwhelm to add more and more new product, we lose sight of the bigger picture--the brand experience we're creating. 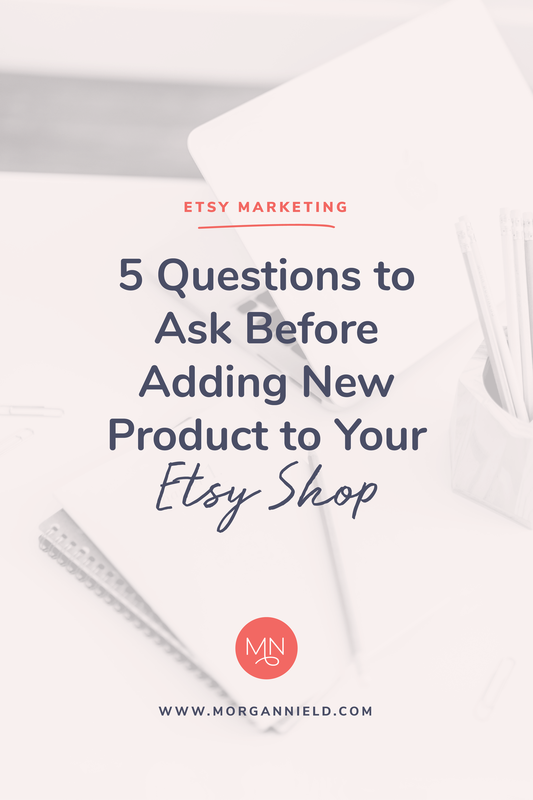 So before you add 10 new products in a hurry to keep relevant on Etsy, take a moment and answer these 5 questions about the product you're planning on adding to your shop. Enter your name and email address below to get your FREE ETSY Marketing Workbook! 1| Is it consistent with my brand? This should be the very, very FIRST question you ask yourself about any product idea. Like, before you go any further into your research & development phase-- you need to make sure that every product you plan on adding to your shop is consistent with yoru brand. Your Etsy shop is a boutique shopping experience and you need to start treating it like one. You are not on Ebay—and shouldn’t be offering a roundup of mismatched items like a garage sale. Your products need to share a common thread—like a basic design or aesthetic—and work together in a collection. This is absolutely CRUCIAL to your Etsy success. If your items can’t be grouped together around a common theme, you are never going to reach your sales goals. Etsy buyers come onto Etsy to get that boutique-shopping experience-- not a garage sale. And if they can’t get that shopping experience in your shop, I promise you they will look elsewhere. There are plenty of other shops on Etsy—don’t give your customers a reason to leave yours! 2 | Is there a real market for my product? Sure, you can make something unique, but is it something will want to buy? Just because you can make it doesn’t mean you should. There are more than enough popsicle stick crafts out there on the market (and they will sit there for a long time because no one will actually buy them)—your product needs to have enough value attached to it that there either a) is a market; or b) a market can be created. If you're just starting out, I 10000000% recommend going with a product that there is already a market for. Yes, that means there is competition out there, but that's a good thing-- it means your idea is validated and people WILL buy it. However, if you’re convinced that your innovative never-been-seen-on-the-market product is the way to go, then all the more power to you! But here’s a quick reality check: You’re going to have to educate your market first before you ever actually sell your product (because if they’ve never heard of it, they’re not going to understand why they need it). 3 | Is it profitable (but seriously…)? This is the #1 mistake I see new businesses make— I was absolutely guilty of it myself in my first business! If you aren't making a profit, you aren't running a business. So yes, you may be an expert crocheter (hey, you should see my mom go to town with a crochet hook!). But if you have Etsy dreams of earning over $100K in a year, it’s time to take a step back and face the reality: There just aren’t enough hours in the day to crochet enough to sell $100K of product by yourself. I see this all the time on Etsy Facebook groups (speaking of which-- have you joined our new Etsy Mastermind Facebook Group? You can request access here!) -- people will spend 8-10 hours on a project and then ask if $50 is too high of an asking price. Girl-- you’re literally making less than $5/hour for that kind of work-- that’s less than minimum wage here in the states! And yes, in all technicality, that $5 is still a profit. But you have to ask yourself: Is that the kind of profit that your time is worth? Is that kind of profit margin going to give you the freedom and flexibility that you’re looking for? It is so, so important to be realistic about your costs and profits in the beginning. So important. If you’re stuck on figuring out how much to charge for an item, be sure to check out my product pricing article here. Take it from someone who earned less than $1/sale when I opened my first Etsy shop-- profit margins that have you earning less than you earn working for someone else usually end up in some burnout. (and paper cuts, in my case). 4 | Is the market already saturated? Yes, digital art printables may seem like the perfect idea-- (no overhead or inventory for the win! ), but if you search for “art print” on Etsy, 3,056,116 Results will show up. Um, yeah. That's a little somethin' somethin' we like to call "saturation." Let me set the record straight: I’m a big believer that you can stand out in any market-- no matter how saturated a market may be. But. I’m also a realist-- and I'll be the one to tell you (in case no one else will!) -- you’re going to have a heckuva time getting found in a niche that filled with product! My best advice? Do some market research. Go down the rabbit hole for an afternoon or two and really see what’s out there. Notice what there's a ton of. Notice what everyone else is doing. And then notice where there's a gap in the marketplace. And that, my friend, is where the real $$$ are found. Story time-- I actually used this strategy when I created my headbands for LittleHighbury-- I had just found out I was having a baby girl, so I instantly hopped on Etsy to buy some baby headbands (because, hello, half the fun of having a baby girl is dressing her up in headbands!). And by typing “baby headband” into the search bar, I was instantly shown hundreds of thousands of frilly, fluffy baby bows and flowers that were as large as a newborn’s head (my husband lovingly refers to these giant pieces of art as “baby satellite dishes”). So while I didn’t find what I was looking for (cute, casual headbands), I DID find something else: A gap in the marketplace. 5 | How will I stand out from my competitors? Fun fact: You absolutely cannot be like everyone else and expect to blow the roof off of your revenue goals. Don’t overthink this one-- I’m not suggesting you add some life-altering elements to your products. However, I AM suggesting that you consider offering better packaging, unique materials, insanely persuasive copy, or even better photo staging. A good rule of thumb? Take a look at what everyone else is doing and then do yours differently. An even better rule of thumb? Download my free 15+ page (!!!) workbook below and follow the competitor analysis worksheets-- by the time you’re through with the exercise, you’ll know EXACTLY what to do to help your brand outshine the competition! Have you joined my FREE Facebook group? If not, you should :) It's filled with all your future Etsy BFF's and a FANTASTIC place to get feedback on your Etsy shop. Oh, and I do a FREE masterclass live-stream every Friday that I think you'll love :) You can request to join the group here!